Bring the boat you love back to life with a new outboard motor REPOWER! Call, click or come by today and you’re on your way to buying a great new outboard motor in Florida! We can replace your marine engine in a few days and we have great financing programs that make it easy to get the new outboard engine you need! For example you can have a new 150 hp installed for around $199 per month. * We have outboards for sale in Florida. It’s easy! Click above and download credit application. Complete and bring it to one of our locations. Repowering your older boat is exactly what it sounds like – it’s installing a new, more modern marine engine in your boat. You can choose to spend a lot of money and rebuild your existing engine, or even better, get a brand new one. Either way this cost-saving option is a great alternative to buying a new boat or continuing expensive maintenance on an older engine. Best of all, you get a more powerful and/or fuel efficient engine and your boats reliability will be assured. 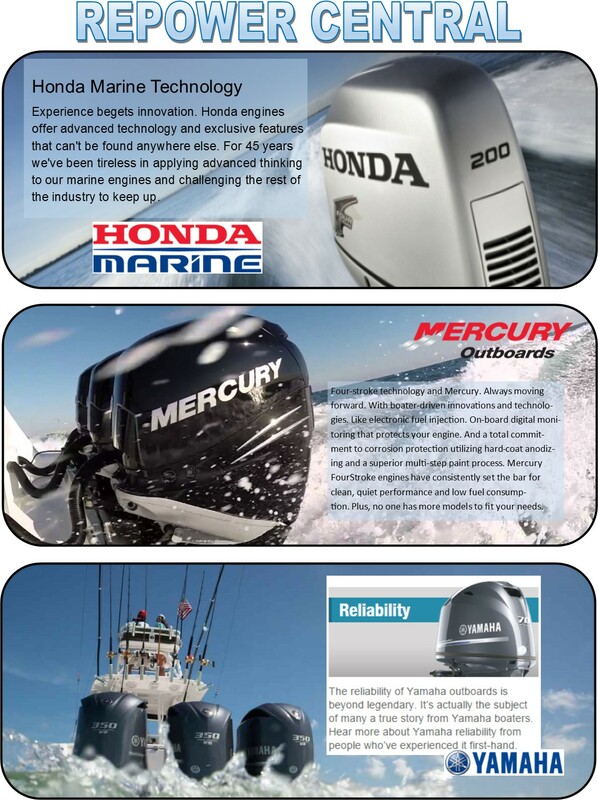 At REPOWER CENTRAL – We stock most sizes of Yamaha, Honda, Mercury, Suzuki and Evinrude outboard motors. Replace your outboard engine at our repower center called re-power central. We also offer outboard engine sales. We specialize in renewing your boat with fresh new outboard motors. We offer easy financing and super low monthly payments on all the brand and model outboard motors you love. Get the best deal on all make outboard engines available! Call, click or come by today for a FREE quote. Our many happy customers rate us 5 stars and you will too. Custom engine rigging, removal and installation services. We can handle all your rigging and special set-up needs. Why Buy a New Engine for Your Boat? Reliability – Make sure your boat runs great each and every time you need it with the latest technology of a new outboard. Fuel Economy – In most cases you will save 25% in fuel costs or more! Resale Value – Perk up the value of your boat with a new engine! Lower Maintenance Costs – With up to a 5 year warranty there are ZERO repair costs and low, low maintenance costs. High Torque – New engines are 4 stroke and have much higher torque for better performance. Long Lasting – 4 stroke technology can last up to 4 times longer than the 2 stroke outboards we grew up on. Better Performance = More FUN! Our knowledgeable and trained engine sales team members are ready to help you weigh your repowering options. We offer all brands of gasoline outboard and sterndrive engines including Yamaha, Mercury, Honda, Suzuki, Evinrude, Volvo and Tohatsu/Nissan. The result will be a better boating experience, and our focus is helping you make the right decision. If your boat is tired, consider repowering while performing seasonal service. This will save time, get you on the water faster, and improve your performance and fuel economy. Call, click or come by today! *With approved credit and 20% down payment. Get a great quote on the outboard motor you need.